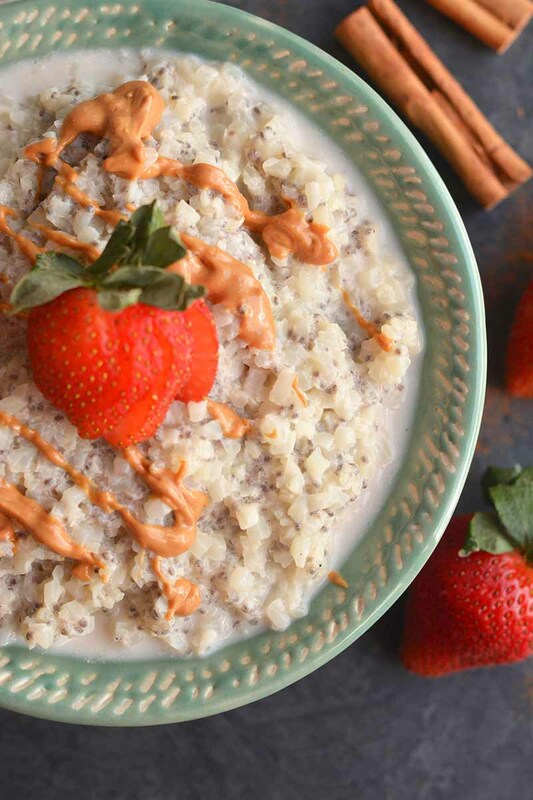 Low-Carb Cauliflower Oatmeal is a creative, low-carb, grain-free spin on traditional oatmeal. Not only does it taste great, but it’s an easy way to pack in an entire cup of vegetables before lunchtime! I know what you might be thinking. Cauliflower in oatmeal?! 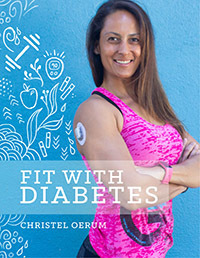 Sweet oatmeal with a savory vegetable? How could that possibly taste good? I know it sounds a bit weird, but you’re going to have to trust me on this one and make this recipe. You will not be disappointed! Once you start making Low-Carb Cauliflower Oatmeal, it will seem as normal to you as kale in a smoothie or zucchini in a sweet bread. 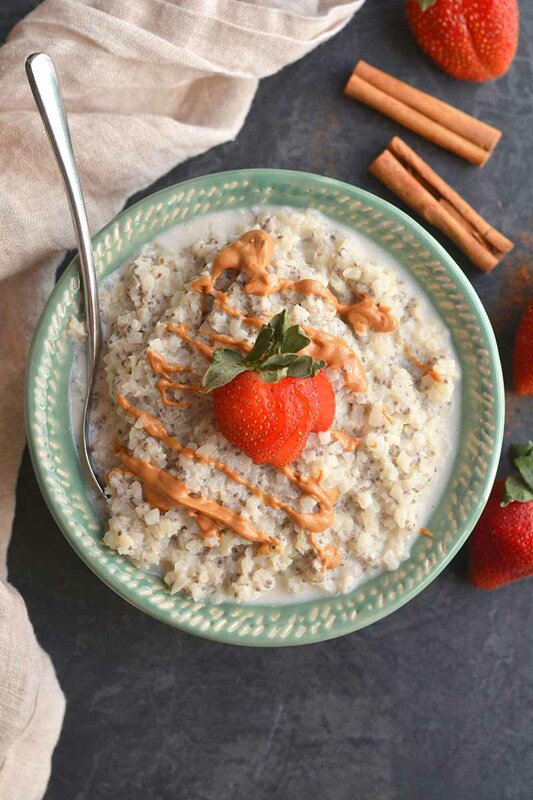 What’s especially amazing about this low-carb oatmeal is that the cauliflower doesn’t just serve as an addition to the recipe; the cauliflower is actually the star of the show. Riced cauliflower (cauliflower processed in a food processor until it resembles grains of rice) entirely replaces the usual base of oats. It’s just as easy as making regular oatmeal! 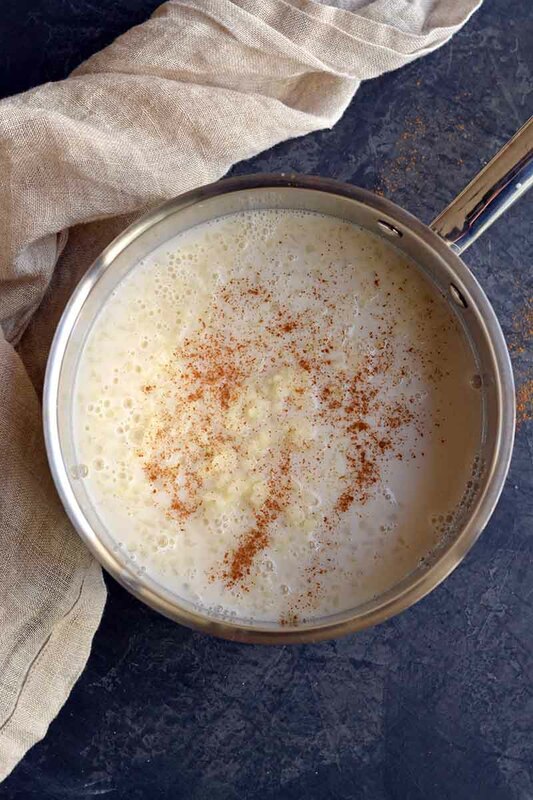 Bring the riced cauliflower to a boil with the unsweetened milk of your choosing (I personally love coconut milk, but you can use almond milk or skim milk), cinnamon, and stevia. Once it’s boiling, you reduce the heat to medium-low and let it do its thing for 8-10 minutes until it reaches your desired consistency. Then you remove it from the heat, put it in a bowl, and top it with a drizzle of creamy peanut butter and sliced strawberries. Your low-carb oatmeal is ready! I absolutely love digging into this in the mornings or even as an afternoon snack. 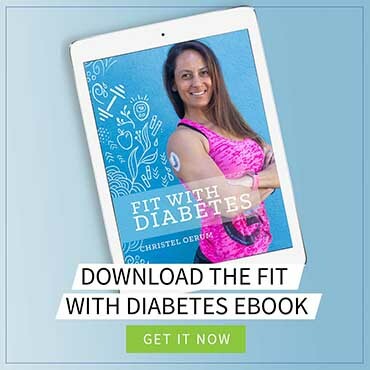 It’s super low in calories, low in carbs, and has a healthy balance of protein and fat. It’s also a really easy way to sneak in an entire cup of veggies into your daily diet without realizing it! The sky is the limit with cauliflower oatmeal. Make sure to always start with a base of cauliflower rice, milk, and stevia – but the rest is completely up to you. You can add cocoa powder, protein powder, nut or seeds, fruit (fresh or dried) – there are so many ways to make low-carb cauliflower oatmeal your #1 go-to breakfast. Does cauliflower oatmeal taste like cauliflower? While I might have sold you on the benefits of low-carb oatmeal with cauliflower (easy to make, customizable, loaded with a full cup of vegetables, great macronutrients), you might still be wondering one thing: Does Low-Carb Cauliflower Oatmeal taste like cauliflower? You will be happy to know that the answer is no! Cauliflower is such a mild-tasting vegetable that the flavor is masked by the other ingredients. In fact, cauliflower is also a great addition to smoothies for the same reason. I hope you enjoy this unique and flavorful low-carb oatmeal. It has quickly become one of my breakfast favorites, and I think you’ll love it too! Of course, you can also continue the cauliflower theme and make my Vegan Cauliflower Pizza with Basil Pesto for lunch or dinner or check out my roundup of the best low-carb cauliflower recipes! 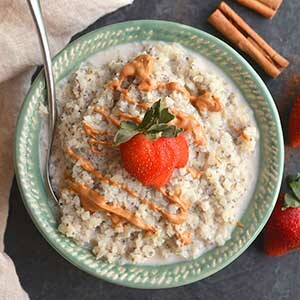 When you’ve tried this healthy low-carb cauliflower oatmeal, please don’t forget to let me know how you liked it and rate the recipe in the comments below! Low-Carb Cauliflower Oatmeal is an amazing low-carb and grain-free alternative to normal oatmeal. It’s just as tasty and easy to make but with a lot fewer carbs and calories. Place cauliflower rice in a pot with milk, cinnamon, and Stevia. Bring to a boil while stirring. Once boiling, reduce to a medium-low heat and continue stirring until desired thickness (~8-10 minutes). If the mixture becomes too thick, stir in more milk to thin it out. Remove from the heat and transfer cauliflower oatmeal to a bowl. Drizzle with creamy peanut butter and top with sliced strawberries. Can you make this ahead of time and then reheat later? Sounds so yummy! Could you do this using the packaged rice cauliflower? I just made it and omg was amazing. I can’t eat any type of oats. I made this as a snack to test my count. However all I had was milk and the new milk fairlife. Not a fan of almond, One day will test it the microwave. Oatmeal coupled with my favorite vegetable!!! I am sure I am going to completely love this, can’t wait to get started!